Arjuna is confused and when he understands that it is useless to continue in a conversation between friends but that he has to ask questions (sisyas te ham sadhi mam tvam prapannam) the result is the Bhagavad-gita, a book that has benefited countless people for millennia. 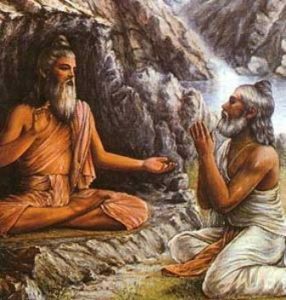 The same is the conversation between Sukadeva Gosvami and Maharaja Pariksit and then between Suta Gosvami and the sages of Namisaranya, that we know as the Srimad-Bhagavatam. At the end of Dvapara Yuga Srila Vyasadeva asks his disciple Vaisampayana to answer Maharaja Janamejaya’s questions and so we have the Maha-bharata. Sage Maitreya asks questions to Parasara Muni and the result is the Visnu Purana, a book that is not well known but deserves to be studied in depth by all those who want to know Krishna. In Katha Upanisad Naciketa asked and Yamaraja answered. So we have one of the most important Upanisads, full of philosophical gems. What do all these circumstances have in common? That someone is asking questions and someone is answering. It is not only those who answer that must be qualified but also those who ask questions. In our case, the qualification is the blessing of Guru, Krishna and Sadhu that enables us to ask questions and answer them. Kali-yuga is a very disgraced era, full qualifications are difficult to achieve. Without sincere questions the answers (and classes in general) may be dull, because the speaker does not feel inspired. It is not inspiring to have an audience where there is someone who falls asleep, another who controls the time, another who looks elsewhere and thinks of something else. But when the speaker see interest in the audience he feels inspired in giving a good speech. “Now is the time to ask questions about the Absolute Truth”. Atha states urgency and atah the belonging to the Vedic tradition. Atha does not mean “at the right time of your life”. “Now” means “now”, “immediately”. If someone would object, “but the Caitanya Caritamrita is not structured as questions and answers”, I would reply that it is full of conversations based on questions and answers. The verse tad viddhi pranipatena (4.43) of the Bhagavad-gita contains the word “pariprasna” which means asking questions. There are two main qualities of a disciple: asking questions (pariprasna) and giving service (seva). Anyone who does not ask questions to the Guru is not a disciple and the Guru should be wary to accept and give upadesa, initiation, to a disciple who does not ask questions, as well as to one who does not offer service. Even here one could go on ad infinitum. In conclusion, asking questions and listening carefully is one of the most important disciplines of Bhakti.